Ghost in the Shell is one of those rare films that can bring together everything that people love about anime. What begins as a very cool-looking action-oriented anime becomes a story that truly examines the meaning of thought and being human. In futuristic New Port City, Motoko Kusanagi is a member of the special police force known as Section 9. She is also a robot, with only a small portion of her body being human. In this world of advanced robotics and AI, the body is referred to as the "shell," while the "ghost" is undefinable by any single word. It is at once the mind, soul, and identity of its owner. 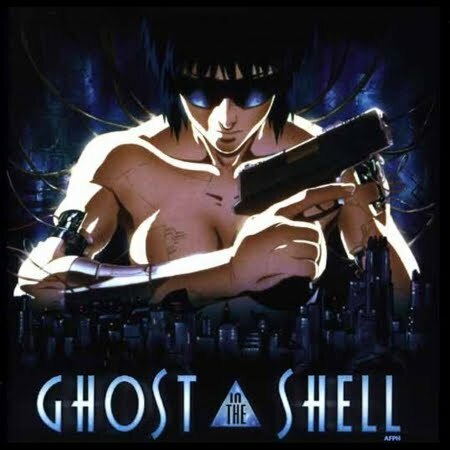 When a powerful and infamous hacker attacks in Japan, Motoko, her partners Togusa and Batou, and their Chief Aramaki, must find the hacker and stop him from causing chaos and political problems. Animation is instantly noticeable in Ghost in the Shell. Everything from the characters to the weapons to the machinery to the buildings is crafted with amazing attention to detail. Every piece of machinery and building is so realistic and detailed that one can often forget that they are even watching a "cartoon." One of the most stunning scenes of this type comes in the opening credits, as we watch the creation of Motoko as her metal parts are assembled and activated. It is obvious that Oshii made sure to pay close attention to the accuracy of the creation of a "Shell." Even so, the character designs can sometimes be a little undetailed and awkward, particularly when people's eyes get unnaturally wide. Even though Ghost in the Shell establishes itself as an action thriller, it still manages to infuse philosophical musings with the explosions. At times, these complicated conversations can really confuse the viewer, especially if they are watching it subbed. However, when you stop and think about what is being said, GitS really has a lot of interesting points to make. This is the film that inspired works like Serial Experiments Lain, The Matrix, and other science fiction plots based on the ambiguity of autonomous thought. Luckily, the philosophy and action are balanced well, so that they very rarely feel contrived or tacked-on. The English dub is listenable, but still has some problems. Most notable is Motoko's mostly emotionless voice actress, Mimi Woods. While I understand the desire to make Motoko seem like a doll, her lack of emotional acting does not help the film. Togusa as well, played by Christopher Joyce, is not very believable. The music takes the same path as Akira, attempting to combine choral chants and African drums to stress humanity in a sea of inhumanity. In one of the most powerful scenes in the film, we simply watch the city go about its ways, staring at buildings, boats, and people. All the while, drums beat in a background beneath the sound of overlapping tribal singing. Ghost in the Shell is an anime that can truly be seen as art. From the unusual opening credits to the simple background musical scenes all the way to the film's action-packed and thought-provoking conclusion, Ghost in the Shell is unforgettable. While it may suffer from dub problems, Mamoru Oshii's exquisite attention to detail, both artistically and story-wise, definitely shows. The shell may seem shallow and action-based, but the ghost gives us so many different things to think about. Like this post? Support Ani-Gamers on Patreon and get access to bonus articles and episodes! Evan is the Editor-in-chief of Ani-Gamers, a freelance reviewer for Otaku USA Magazine, and a frequent anime convention panelist. You can read his ravings about anime, manga, games, politics, music, and more on Twitter @VamptVo. Ani-Gamers is licensed under a Creative Commons Attribution-NonCommercial-NoDerivs 3.0 Unported License. Permissions beyond the scope of this license are available at http://www.anigamers.com/reuse/.